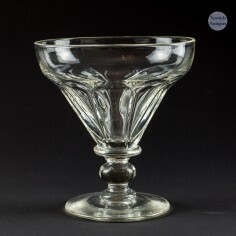 The ubiquitous rummer is perhaps one of the broadest classifications of drinking vessel, with a wide variety of shapes, styles, finishes and decoration falling under the broad remit of the name. 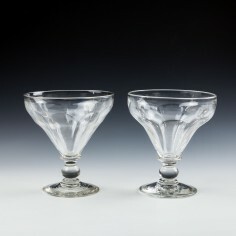 With its derivation firmly entrenched in the parochial adoption of the German name roemer - glasses originating from Holland and the Rhineland with considerably smaller bowls and often seen in old masters paintings - the accepted classic "anglicised form" dictates that it should have a commodious bowl, short stem and substantial foot, as befits a largely utilitarian piece. 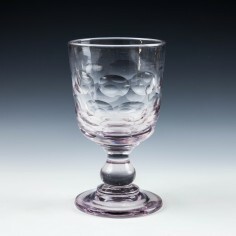 It is difficult not to be too dismissive of pieces often made in a plain fashion or in sets for use by the public at large, but it must not be forgotten that there are notable examples of almost every type of glassware, no matter how commonplace the majority of pieces may seem to be. The rummer is no exception, and with diversity having elicited many different forms, Victorian artistry has given rise to some exceptional pieces. From flashed colouration applied to the edges of moulded petal scaling through finely detailed cutting to remarkable engraving which took advantage of the relatively large, plain faces to accommodate meticulous and intricate images in intaglio, there are many rummers which are particularly eye catching, and they can make for an engaging collection if one seeks out these more fetching examples. That said, so wide was the use of the vessels that accumulating a collection of pieces decorated for presentation or commemoration can impart much about common social history - you will find weddings, sporting events, births, deaths, notable achievements and much of the miscellany of Victorian life recorded on rummers of the period, which were often presented as gifts having been appropriately embellished or personalised. Fully-coloured or sparingly highlighted rummers are more rarely encountered and make for another intriguing sphere of speciality in their own right - consider the striking examples which have white rims, Bavarian in origin and - it has been postulated - intended specifically for use with the pale wheat beers or hefeweizen of the region. Of a slightly more tangental departure from the norm than simply one of the many variations in shape it is possible to chance upon larger than average rummers which feature pouring lips moulded in to their rim. Such a piece is likely to be a mixing or toddy rummer, which in part may give some credence to the purported relevance of the name to the use of the vessel with rum itself. This was often a constituent part of a hot toddy, initially mixed in the larger rummer with the rum, brandy - occasionally gin - water, lemon juice and spices being blended together. 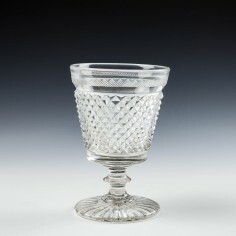 This concoction would then have been decanted in to smaller rummers, simply poured or with the aid of a toddy lifter, at which point sugar would have been added to taste and ground in with a glass "toddy stick", an ancestor of the modern "muddler" - a process which over time would have clouded the glass and left indelible scratches to indicate the use of at least some rummers for the consumption of the drink after which they are so often (and erroneously) thought to have been named. 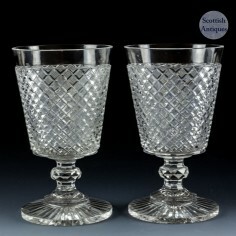 Two lens cut English antique dram glasses which you can see on out antique online store scottishantiques.com. 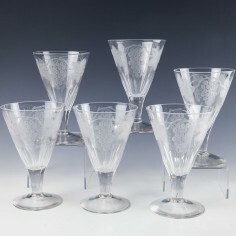 Where we specialise in rare and unique antique drinking glasses ranging from 17th to the 20th century. 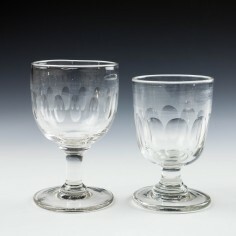 This glass used in the manufacture has been "washed" or doped. 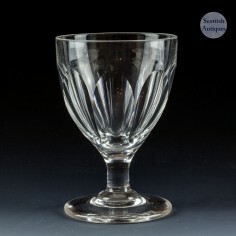 This process was undertaken to decolourise the glass. In this case it has been over-doped, hence the amethyst hue resulting from excess manganese oxides.